When people go on vacation nowadays, they often get on a plane so they can get to their destination as quickly as possible. Their priority is spending as much time as they can on the beach or with relatives, and while we at GTS understand that, we also believe in taking time to enjoy the journey. If you’re interested in seeing America the old-fashioned way, on the highways that people have driven for decades, consider hiring a charter bus. You can sit back in comfort and leave the driving to us, and won’t have to worry about missing a connection or sitting in airport. One aspect of Americana that people miss when traveling by plane is roadside attractions. Many of these unique spots are hard to find, but if you plan out a trip that includes hitting as many of these as possible, our driver will make sure you see all of them on your list. Famous roads such as Route 66 or the Pacific Coast Highway offer ideal spots, as well as breathtaking views of the country. Our buses, complete with reclining seats and plenty of luggage storage, are perfect for these longer trips. 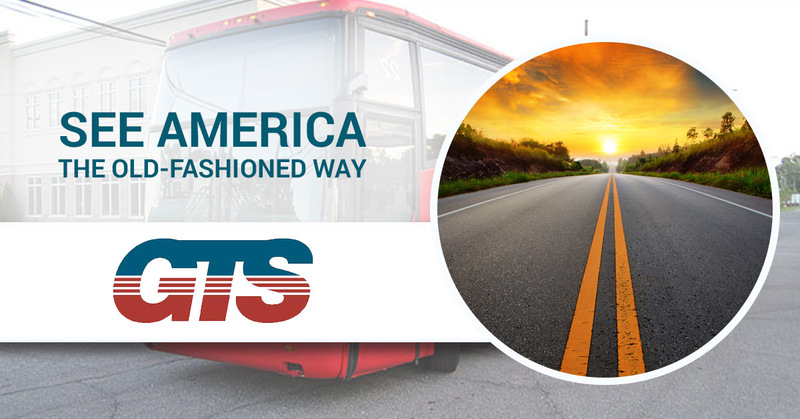 If you’re planning on seeing as much of the country as you can in your lifetime, let GTS help you see it with comfortable seating for everyone in your group, as well as professional service that won’t leave you feeling frustrated. Our goal is to give you the trip of a lifetime, no matter if it’s the first or the fiftieth trip you’ve been on! Contact us today to schedule your next bus tour with us!